A battery emulator is an electronic instrument that will simulates many real battery electrical properties and characteristics. These characteristics are power, current, voltage, ESR, etc. It supplies the needed voltage, power, and current to a handheld device similar to an actual battery does. Generally an emulator will replace the battery inside a portable device for testing purpose. The emulator empowers test engineers to easily and thoroughly test these portable systems. Thorough testing is required both for product developments and final production. Figure 1. TS250 in emulation mode is connected to a charger for easy testing. A battery emulator is often used to stress test battery charger if it is operating correctly over all possible conditions, include normal and fault conditions. For instance, typical rechargeable lithium battery useable voltage range is 3.0V to 4.2V, but its voltage can be as low as 0V to 3.0V when it is severely depleted. The charger must be stress tested to make sure that it can recharge a battery at any voltage within the range. The advantage of an emulator is it can change the emulated voltage in a matter of a second. Using an emulator, you can emulate the "battery" to any voltage by means of adjusting the output voltage. Charger circuit that charges the battery is included in a lot of mobile electronic systems. The charger circuit must be fully and methodically tested to be certain it meets all of the specifications and reliably charge the batteries. A typical charging cycle is from depleted battery to fully charge typically takes few hours to complete. For that reason, charging cycle testing needs several hours. A complete charging cycle test can be done in just a few seconds when the battery is replaced with an emulator. Similarly, it could take a couple of days to empty a real battery in a portable handheld system. However an emulator can easily simulate the battery becoming drain within a few moments. While battery is simulated and "charging", engineers can monitor how the device and charger responds as the “battery” is depleted. A battery emulator can test these mobile devices to ensure that they met all of the specifications without waiting for hours. Furthermore, an emulator can easily simulate an overcharged battery cell as well as a completely deplete one (no voltage), both of which cases are difficult to do with an actual battery. Figure 1 illustrates how an emulator is connected to the battery terminals for charger and system testing. The emulator is replacing the battery for fast and convenient charger testing. Turn the knob from left to right to simulate the battery voltage is being increase to stress test how the charger is responding. Observe the “battery” current on the LCD display. In summary, a battery emulator is an important piece of bench equipment for battery charger and cell balancing testing. Medium-powered electronics devices generally use multiple batteries connected in series for high power and voltage. These battery packs usually achieved optimal battery energy capacity by utilizing active cell balancing circuits. The balancing circuitry and the charger itself need to be properly tested. In order to efficiently and easily test the cell balancing circuit, a few emulators are needed as shown in Figure 3. Each emulator emulates a battery cell. System engineers can simulate one or more cells are “out-of-balance” to stress test how a battery-cell-balancing circuit behaves. For example engineer is able to simulate one of the cells is being overcharged and see how the balancing circuit behave. By the same token it's very quick to recreate one of the batteries is broken (low voltage) and validate the cell balancing circuit is acting properly. In short, battery emulator is an important device for testing charger and cell balancing circuits in mobile systems. Figure 3. Multiple emulators are used to emulate a battery pack to test cell balancing circuits. The terms battery emulator and battery simulator has been used in the electronic engineering industry and academic. However, there is no distinction between the two. They both perform the same function of emulating a battery. Some people preferred to call it simulator while others named it emulator. Their purpose is to replace an actual battery for the convenience of testing. The terms emulator and battery simulator are interchangeable. The TS200 and TS250 are high output current four-quadrant power supply and amplifier that can source and sink current the same way a real battery does. Thus they are battery emulators. They have a DC OFFSET control knob that can adjust the voltage to simulate battery voltage changes. 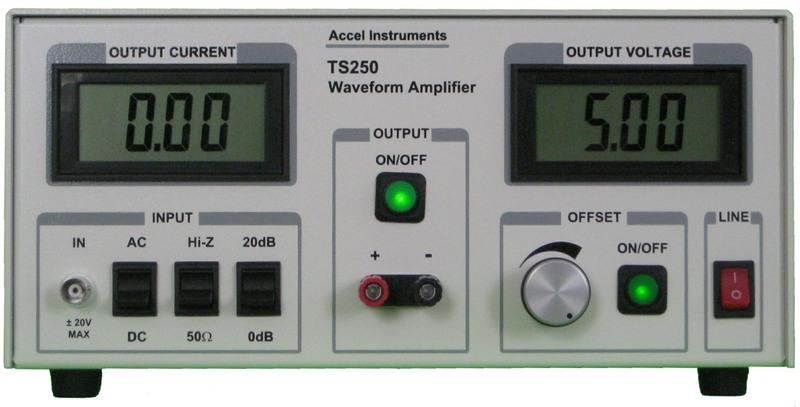 Additionally the TS250 features current monitor LCD display that monitors the emulated battery current. 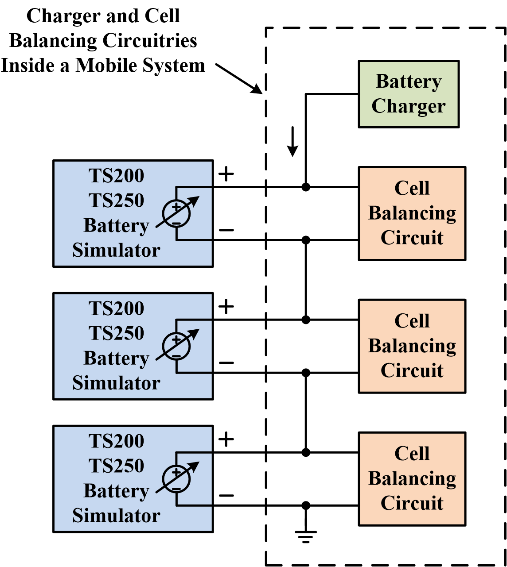 Figure 1 shows the TS250 connection and Figure 4 shows the TS200 battery emulator connection. Lithium ion battery charger uses constant-current-constant-voltage (CC/CV) charging technique. Depends on the battery voltage, the charger charges the battery cell either constant current or constant voltage. Figure 2 shows a detailed CC/CV charging profile at various and stages and cell voltages. At low voltage, less than 3.0V typical, the battery-cell is slow (trickle) charged at a low current. This trickle-charge current is usually one-tenth of the regular charging current. During this stage the current is constant. This low-current stages usually last less than 5 minutes. When the cell voltage reaches above a threshold, typically 3.0V, the charging current is increased. The charger is entered another stage of charging. 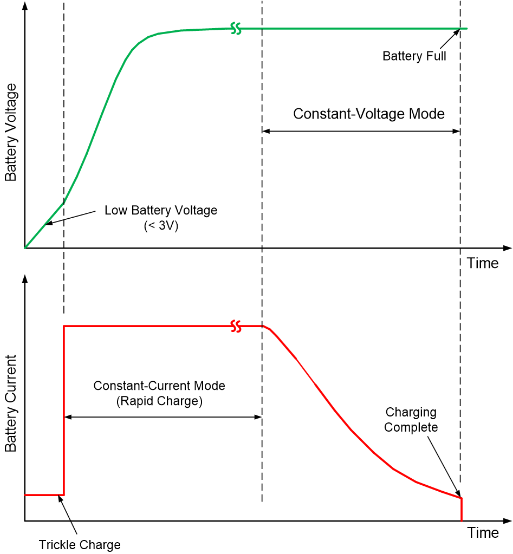 In this stage the charger output current is still in constant current mode but at high current (rapid charge). The charging rate is typically 1C. The bulk of battery recharging is in this stage and typically takes 1-2 hours or more. When the battery pack voltage reaches the "float" voltage, typically 4.2V but depends on battery chemistry, the charger circuitry enter into a constant voltage stage. In this mode the cell voltage is held at constant. However, the current into the battery is gradually reduced as the battery is nearing full. This stage takes about one-third of the charging time. While the battery voltage is held at constant, the current is reduced. When the current is drop low enough, typically 1/10 of the normal constant charging current, the battery is considered full and charging can be stop. Figure 2. Lithium ion battery charger using CC/CV charging method. Figure 4. Battery emulation connection using the TS200 to test a charger.